For the wedding of your dreams, you need someone who will listen to your vision and help you develop your ideas of the perfect wedding day. With expert planning and organization, Ann not only helps you plan your wedding day and the parties that celebrate this passage in life (engagement parties, bachelor and bachelorette events, and rehearsal dinner), Ann makes sure that the plans you have so carefully made are effectively executed and leaves you and your family free to enjoy the festivities. How many guests will actually come and how many will comfortably fit in a venue? Do we have space for table service or a buffet? How should the tables be set up, the room lit and decorated, and how will my guests perceive the evening? What location will best suit my needs and budget? With Ann’s extensive experience planning thousands of events, she guides you to the best venues and helps you set the logistics in place for a successful celebration. With so many florists, caterers, photographers, and other professionals to choose from, how do you know who will give you the results that you want? Ann’s network has given her the opportunity to work with many vendors and she can help you narrow the selection to the vendors most qualified to provide the quality products that you want. Once your vendors are selected and the plans in place, Ann works with your team of vendors to keep everyone on track for a perfect event. Ann helps you prepare months in advance to choose your gown, tiara, veil, and accessories that leave no doubt in your groom’s mind that he is marrying the most beautiful bride in the world. Ann will schedule gown fittings and practice applications of makeup and hairstyles with the veil to make sure there are no surprises on the day of the wedding. One of the most important decisions regarding the photography and the way your look holds during a busy day is your choice of make-up style, artist, and the appropriate choice of hairdressing to complement you gown and headpiece. Ann can assist you with trial run-throughs with vendors who’s specialty is brides and their attendants. Ann will assist with scheduling salon services in wedding timeline as needed for for the bride, groom, the attendants, and family members. Putting your vision and personality into an event makes the day memorable. Ann helps you to find just the right details and people to bring life and joy to your event. Then, Ann sets a realistic itinerary for the event to make sure all goes according to your plan. With access to a variety of providers, Ann will arrange transportation for the wedding party and guests as requested. Using her extensive background in the hotel business, Ann can negotiate room rates for blocks of rooms, hospitality suites, and special services including delivery of amenity baskets to guests. 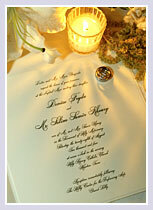 Ann can also assist with wedding night reservations for the bride and groom. Ann knows how to best handle even the stickiest of social situations and will advise you on any areas you request. She helps you with wording for your invitations, creation of maps, calligraphy needs, and all other stationary needs. Ann is familiar with newspaper requirements for announcements and will help you with the text and images to make this process simpler. As needed, Ann will track your responses from guests and confirm plans with guests who do not indicate whether they will be attending. This enables you to accurate guest counts for the caterer and other vendors that might be affected. Ann knows you want to make sure your guests, family, and attendants know how much you appreciate their presence on this important occasion. She can assist you with all your gift and engraving needs for these special people in your life. With her extensive business experience, Ann works to negotiate the best prices and terms with vendors you choose to participate in your event. Clients have often commented to Ann that she has saved them from costly mistakes and helped them to get the most value for their investment.